Poker Night, All Hopped Up! Famous combos: Holmes & Watson, macaroni & cheese, beer & poker. Inside this gorgeous gift tin you'll find Beers & Bluffs together as one for the first time on custom beer-themed playing cards and chips. 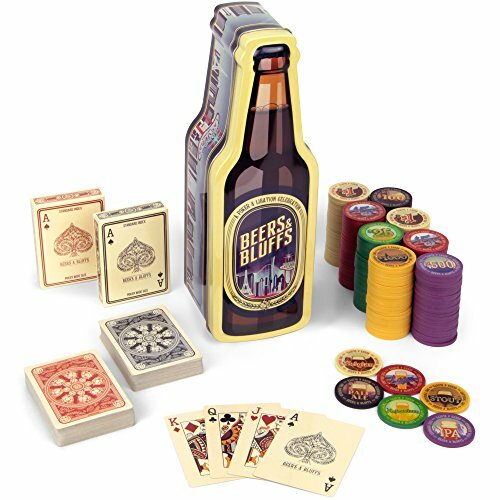 The perfect gift for the beer & poker lover in your life, even if that happens to be yourself! This novelty gift tin is the perfect travel poker chip set. Weighing just under 3 pounds, it's easy to pack up, pick up, and show off your custom chips and cards--just slide the lid right off the tin poker carrying case. Great for texas holdem, blackjack, and other casino games. TASTY ACES: Includes one black deck and one red deck of custom cream playing cards with wheat and hop aces, sized poker wide 2.5" x 3.5"